Harmonix is excited to announced that a selection of classic 80s tracks is now in the Rock Band™ 4 Music Store for Xbox One and PlayStation®4, including music from Depeche Mode, INXS, and Naked Eyes. Rock Band 4 players can celebrate the 80s with these classic tracks, starting with Depeche Mode’s “People Are People,” the group’s first breakout single in the United States, release in 1984. INXS’s 1985 Billboard Hot 100 hit “What You Need” will also be added to the Rock Band Music Store. Finally, Naked Eyes’ popular 1980s take on the catchy “Always Something There To Remind Me” rounds out this week’s Music Store releases. Each track can be purchased individually for $1.99. Mad Catz Interactive, Inc. also announced the start of pre-orders for the all-new Rock Band 4 USB Microphone, expected to ship in time for Holiday 2015. Designed to enhance the award-winning Rock Band 4 gameplay that enables up to three vocalists to harmonize in-game, with the stage-grade Rock Band 4 USB Microphone players can jump into music and join the fun. Boasting a wide dynamic range and high Signal to Noise Ratio (SNR), the Rock Band 4 USB Microphone provides a studio-like experience for at-home singing sessions. Upgraded frequency response provides distortion-free vocals, ensuring that your voice is heard with utmost clarity, and the extended-length 15 foot USB cable provides plenty of room to rock around your living room! 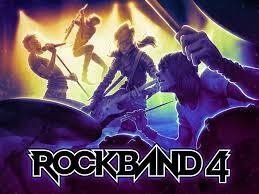 Called “the new benchmark for rhythm gaming” by GamesRadar+, Rock Band 4 delivers the ecstatic rush of a live full-band game experience like never before. Rock Band 4 builds on the core gameplay people love, with brand new features including game-changing Freestyle Guitar Solo gameplay that allows players to craft their own face-melting and truly original guitar solos. For more information on Rock Band 4 and to stay up to date with the latest news and announcements, head over to http://www.rockband.com and follow @RockBand and @MadCatz on Twitter for updates.